We finally bought baby their first outfit today – well, not so much an outfit but babygro etc. Exciting! 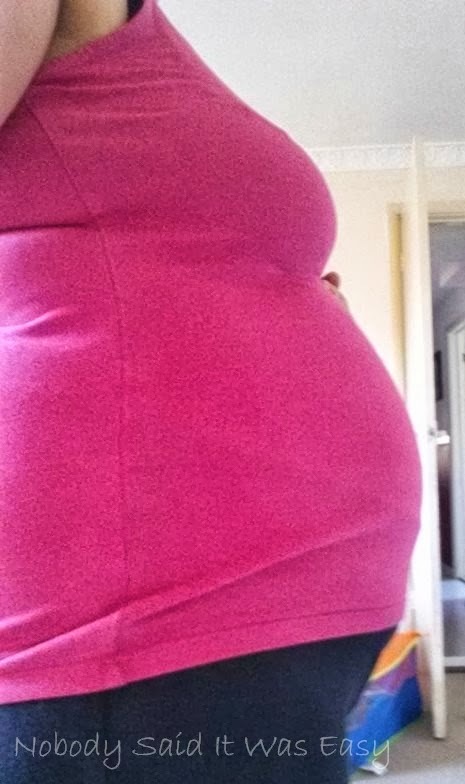 Also managed to get another bump photo – it still looks small but it feels gigantic to me! Though I think baby is a bit low today. I woke up with really bad heartburn (the worst yet) in the middle of the night so I didn’t get much sleep last night. Though when I did sleep I think I slept funny as I’ve been so achy today. I had my 36 week MOT with the midwife today. Baby is measuring right on ‘target’ (though looking at the centile chart they have stuck in this time based on what little man weighed, this one is aiming for around 9lb 9oz! Little man weighed 7lb 8.5oz! ), the heartbeat was all good, and they are very low down and 1/5 engaged! Regarding me, my BP was fine, though my sample showed I may have a UTI but she said they will ring me if so when the results come back. She also had to do a blood test to check my iron levels but couldn’t get any, she left me with a nice bruise though. I ended up going up to pathology at the hospital in the end. My home birth also looks all set to go and they will ring me next week to let me know when my gas & air, etc. will be delivered! I’ve been an emotional mess today. I’ve been in tears numerous times this morning, little man is just being an absolute nightmare, or maybe I’m just too sensitive at the minute! I also had a conversation with a checkout lady whilst shopping today (I must have looked uncomfortable or something): Her: “Are you ok?”; me: showed her my bump; her: “Oh I see, how long left?”; me: “3 weeks”; her: “Maybe!”. Yeah, thanks for that! Oh man. I’m right at that stage now where I am both physically and emotionally exhausted. I have been in SUCH a bad & upset mood today. I must have literally spent half the day crying. Little man was up at 6.20am so we went in the living room and I did the bad Mummy thing and put the TV on for him while I kept dropping off having a snooze. He has then been a nightmare all morning. Smacking me, kicking me, pulling my hair, throwing toys at me, throwing his (empty) Lego box across the room because I dared to turn Peppa flaming Pig off! I admit I just wanted to run away today as I have been in such a state all day. And then I get told “not long now then the fun really starts!”. [Another] yeah, thanks for that! I know it sounds awful but I’m glad he’s at nursery tomorrow so I get a little rest! At 36 weeks, berry is the size of a coconut. They are still gaining weight and becoming rounder in appearance. The bones in the skull can move and overlap each other allowing them to pass through the birth canal more easily. They will probably (though not necessarily) be in a head down position. That day that I became another statistic. One of the worst of our lives. But we gained another gift. A gift from our angel. But we remember you even more so today. On the date that we lost you. But not emotionally or your memory. Hello second trimester! I never thought I’d get this far after my last pregnancy, so I’m feeling a bit of relief now, and can start to relax a bit more. Had a rather emotional day today as it was my Grandad’s funeral. So I am emotionally tired tonight. I also had an interesting dream last night about berry’s gender! I wonder if it will come true? It did with little man. Obviously I’m not going to give you all the details though as it would spoil the surprise if it is true… I’m getting roughly the same amount of boy/girl predictions at the minute though. Absolutely shattered today after lots of preparation for my fundraiser tomorrow. Couple that with chasing after a nosy hyperactive toddler too and I’m about ready to drop. I’ve had awful shooting pains in my stomach too which reminded me I needed to have a rest to take care of berry (and myself of course). I was in bed before little man last night, I went at 9pm and apparently he fell asleep at 10. All in all I had 11 hours sleep, and I can tell you that I needed it! It’s been all go again today though preparing for MiL’s funeral tomorrow. Berry is the size of a tangerine. The vital systems are all fully developed. The body is starting to catch up with the oversized head! The intestines, liver and pancreas are starting to work. All 20 teeth have now formed and are hiding under the gums.